Keaton Mason and her fiancée were on the way to the hospital to deliver their first child, but just 15 minutes from their home, their daughter decided she couldn’t wait. 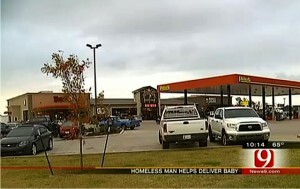 So just before 10 p.m., they pulled off into a truck stop and delivered the little girl in the back seat of their car. It was at that moment that what was supposed to be one of the most joyous events of their lives turned into a horrible nightmare. “The lady was screaming, ‘My baby, my baby’s blue…she’s not breathing,” said Jennifer Morris who was at the truck stop that night. Already on the phone with 911, the panicked couple just didn’t know what to do and, quite likely, they couldn’t calm down enough to follow the dispatcher’s instructions. But nearby, an angel was listening. Gary Wilson, a homeless man just passing through, heard Keaton’s cries and responded. 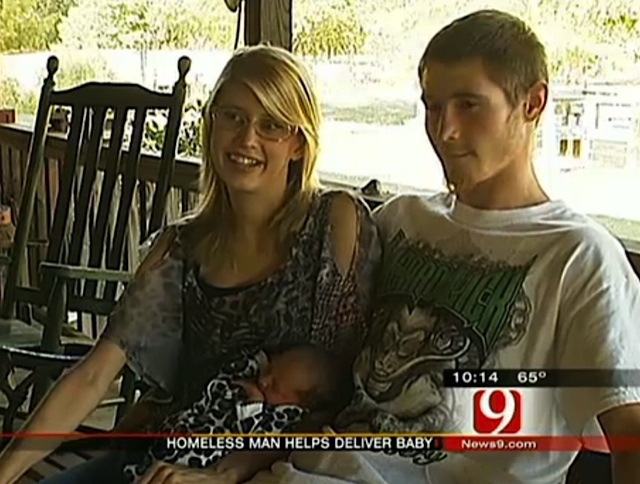 He immediately took action, followed the dispatcher’s instructions and saved the baby’s life. Gary managed to free the little girl’s neck. He then tied her cord, according the to dispatcher’s instructions and rubbed the infant’s back until she responded. He even managed to calm Keaton down. “He kept me pretty calm, actually. He said ‘Everything’s okay. She’s okay. She’s breathing,” Keaton said about her hero. When paramedics arrived, they found a calm and relieved mother with her living, breathing baby girl. But they found more than just that – they found Gary standing with a sign. “[I] looked over and this guy was holding a sign saying Memphis,” said paramedic Tim Ward. He hadn’t asked for so much as a meal or a place to stay – all he wanted was a ride. He ended up getting all three. The truck stop had given Gary the meal and a place to stay that night. Though no one really knows where he went or who took him, Gary was gone the next morning. He had told others at the truck stop that he was from Montana making his way east to Jacksonville, Florida. Some are calling Gary’s appearance a miracle. Keaton just calls him her angel. And as for little Tatum Brown, the little girl’s life he had saved, doctors say she’s doing just fine, despite being a bit on the small side (4lb, 11oz) and four weeks premature. Mom Welcomes a Set of Five!